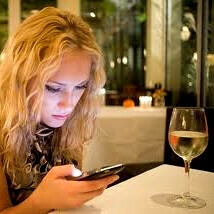 Have you ever broken up with your girl/boyfriend over a text message or mobile email? Have you spent most of the time during fancy restaurant dinner staring down at your smartphone screen instead of the people across your table? Is the time your phone screen spends unlocked starting to equal your TV time? If so, you are seemingly in the majority, especially if your age ends with the -teen suffix. Dr James Roberts, of the Baylor's Hankamer School of Business, that commissioned a study on the compulsive behavior behind phone usage these days, revealed that it has all the symptoms of a substance addiction, and is affecting our interpersonal skills on a grand scale. "Mobile phones are a part of our consumer culture. They are not just a consumer tool, but are used as a status symbol. They're also eroding our personal relationships," said the good doctor. The team concluded that the youth studied during the research phase showed the tendency to check their phones about 60 times day, spending up to seven hours in some cases in total of messaging, checking the web, fiddling with apps and so on. "At first glance, one might have the tendency to dismiss such aberrant mobile phone use as merely youthful nonsense - a passing fad," he added. "But an emerging body of literature has given increasing credence to cell phone addiction and similar behavioural addictions." How we keep having relationships in the world; Find someone with the same interests. 1 game addict + another game addict = best thing ever. Rude and uncouth is rude and uncouth - regardless of the medium. Fu*k. We don't care. Geeks or Nerds like us never engage in a relationship. We are Forever Alone Guys. Nope...i'm not with you. There's a thing called "LIFE"...and even though i am a geek, i love being loved! I'd read this article, but I've got to check my phone! I have to admit I broke up with my girlfriend over a text message. she was avoiding me (personally and calls) every time (everything just went downhill), so I had no other option to text her and get done with it. In other hand, when I meet with people at dinner or social events, I HATE when they stare at the phone the whole time, the same when I go to see a movie... (It's ok if you just check the phone and put it away, but c'mon, is very rude to text and "having a conversation" with someone right in front of you) People are not polite anymore, I just put the device in silence and be social or enjoy the show.